Note: this article begins a multi-part series on using traditional texts to further the goal of inculturation in Native American parishes. When Catholic missionaries first arrived among the native peoples of North America, their first translation priority was basic prayers like the Our Father, Hail Mary, and Glory Be. 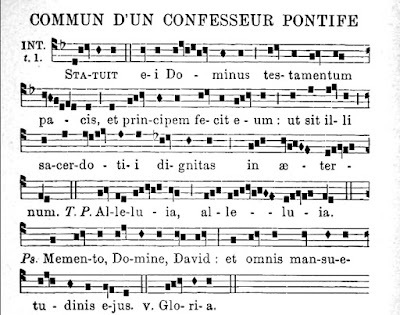 As converts began to understand and participate in the sacraments, these common prayers were often sung devotionally during Mass. This practice was the birth of what would later develop into the Indian Mass. St. Georges Church on the Innu Reserve of Ekuanitshit, Mingan, Quebec. Although few American Indian parishes can today boast as well-formed a liturgical tradition as those along the St. Lawrence, most Native communities have had, at the very least, a few common prayers and hymns translated into their languages. This fact presents us with a grand opportunity to both revive an old tradition and provide a more historically grounded approach to inculturation than has been typical of late. We only need to model our liturgical development on that of the early missionaries; and one particular Mass they have left us offers us a nearly perfect way to begin. The Montagnais missions, founded among the people now called the Innu in the province of Quebec, were among those that developed distinct liturgical practices. 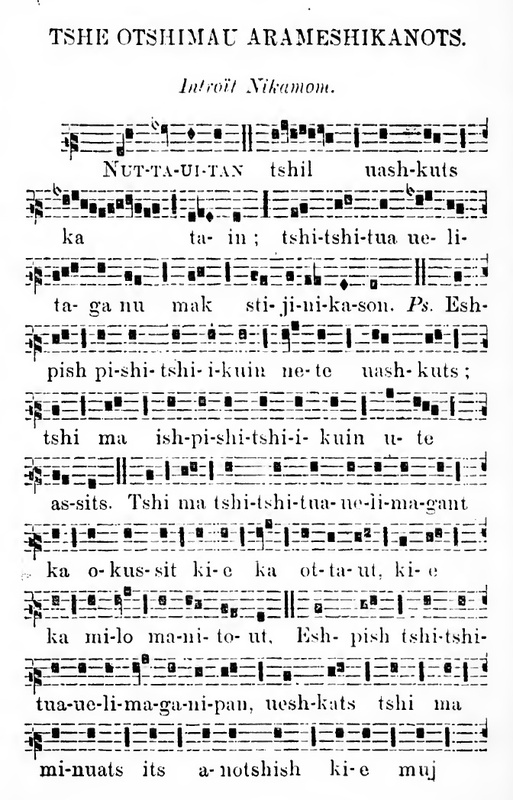 Their liturgies have been documented in a number of 19th century books, among them the Ir Mishinigin (1893). 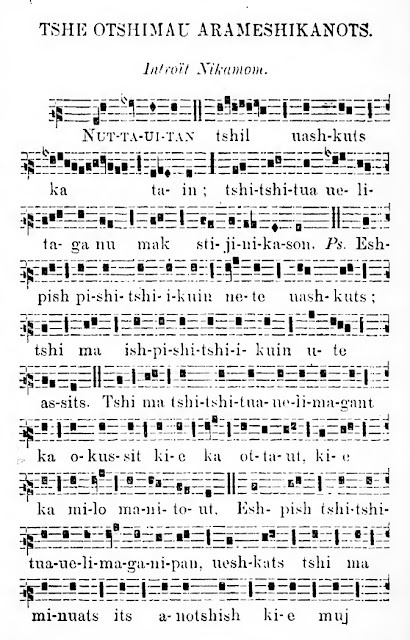 There we find a Mass titled "Tshe Otshimau Arameshikanots", or "The Sachem's Mass", named apparently because the Ordinaries, while mostly in the Montagnais language, are melodically based on the Messe Royale of Henri Dumont. 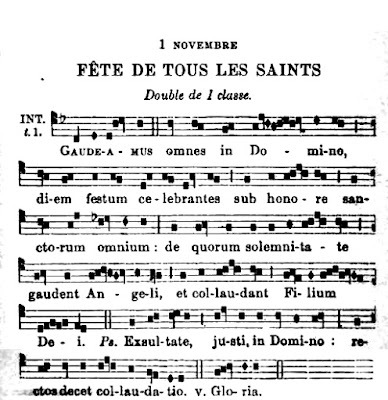 The Messe Royale is not often heard nowadays but it was formerly popular in Quebec and can be seen in a number of old Graduals from that diocese as well as in chant books from the province's various Indian missions. Our Father, Who art in heaven, hallowed be Thy will and Thy name. Ps. Have authority over the earth as over heaven. Glory be to the Father, and to the Son, and to the Good Spirit, as it was formerly and will be again, now and always, Amen. Our Father…..etc. As this Introit is composed of what are already fairly common prayers, it is an ideal first step toward the development of a native-style Mass in communities that wish to have one but do not have an existing liturgical tradition to draw from. The great advantage of the Sachem's Mass in general is that it is an authentically Native setting which can be satisfactorily sung with a minimum of linguistic, musical, or liturgical adaptation. 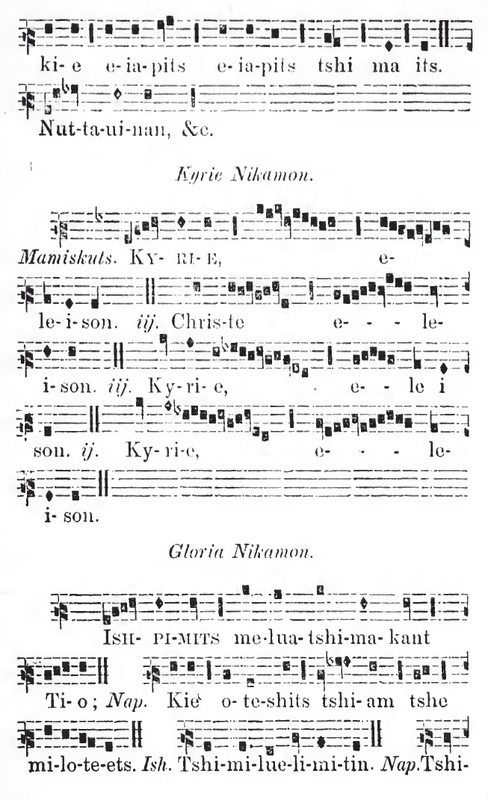 This adaptation involves, first, assembling the Introit from native translations of the Pater Noster and Gloria Patri, and then setting them to the chant shown in the Ir Mishinigin given above. 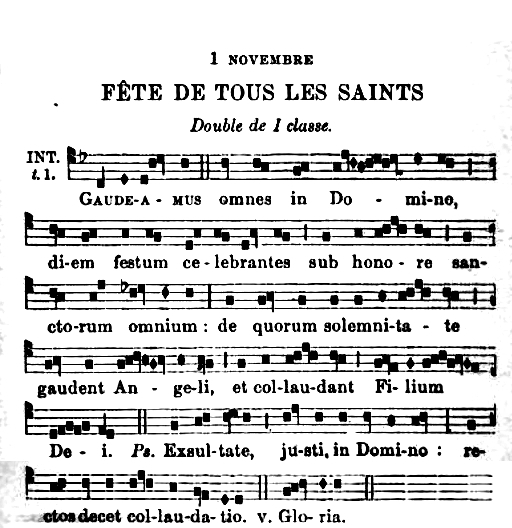 The completed Introit can then take the place of the entrance hymn. 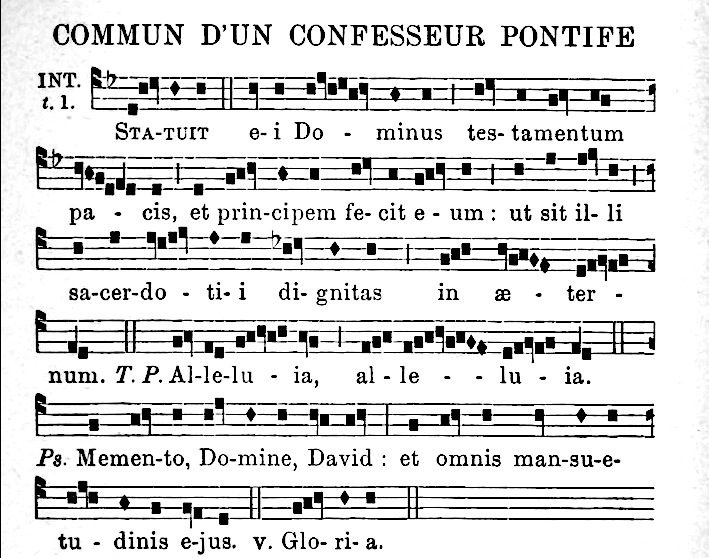 Secondly, the Ordinaries of the Mass are sung to Dumont's Messe Royale. Native-language versions can be used if these already exist, but if not, the ordinaries can be sung as is while appropriate translations are made and permissions sought where necessary. 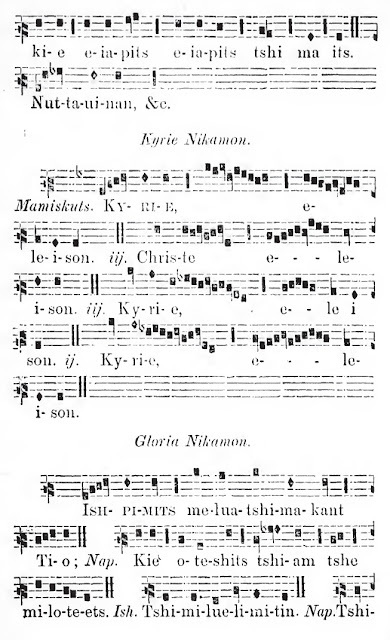 Latin chants are well represented in the mission chant-books—and many Algonquian-speaking tribes like the Montagnais sang the Kyrie in Greek, as shown above. Ironically, using classical languages for the ordinaries would actually be more faithful to American Indian liturgical tradition than using English or French. Overall, I believe native communities can see extensive benefits from this kind of revival. First and foremost, it will help preserve and promote the distinct liturgical traditions that are proper to them. Second, having portions of Sunday Mass in native languages can help reinforce any language-revitalization programs taking place in schools and can serve as a vehicle for these languages' regular continued use even when there are no longer any native speakers. Third, the development of native plainchant and polyphony will allow the Church to again assume its traditional role as a patron of the fine arts and give native composers templates of very high artistic quality to work from. In the coming weeks, I hope to lay out how communities can set their sights from this simple first step toward the fuller, richer Indian Mass that we see in the most liturgically advanced churches like St. Regis at Akwesasne and St. Francis Xavier at Kahnawake. Meanwhile, we will next look at an intermediate stage in the development of native liturgies: the cycle of Introits in the mission of Kanesatake/Oka. Claudio is the founder of Ancilla Press. He has written and edited numerous popular and scholarly books in linguistics, history, and liturgy as well as articles for Latin Mass Magazine, The Remnant, New Liturgical Movement, and Liturgical Arts Journal. He blogs at Letters from Hoquessing and runs Holy Nativity Radio, playing chant and hymns tailored to the liturgical year. A native of Philadelphia, he resides in the Pocono Mountains with his wife and children.